The things we find amusing in video games can often be quite strange – and often repetitive – in nature. Ah, and you see, both of those most certainly apply to Kitten Smack, a game which has you… well, smacking a kitten around. Literally. 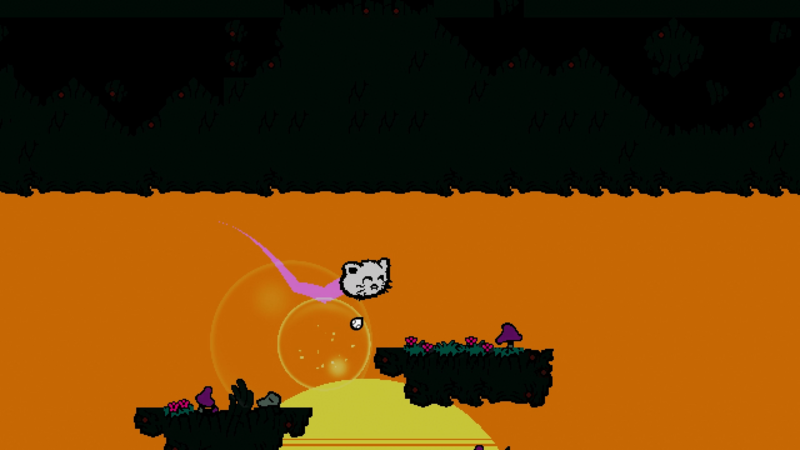 At least you’re not actually laying a finger on the poor feline (or its head, which is the only part of it that appears on-screen, rather), instead pushing it around the level with audible bursts. Yeah, I don’t know – some weird magical thing called ‘soundblasting’. While hardly the most engaging experience ever, Kitten Smack does what it sets out to do rather nicely: provide cat haters with a way to virtually torture the head of one such. Just kidding. Or am I? Of course I am, although during my brief time spent soundblasting to whisker (get it?) away at this here pussycat I did wonder why this was happening; and perhaps more importantly, where the rest of its body has gone off to? But try as I might, I should find the answer to none of my questions before catface met its untimely demise, over and over again. Obstacles were surpassed by using sound in a strange way, the odd actual slap simply there for fun. What? Okay fine, so I lied about not actually hurting the poor thing, but it’s a video game and I wanted to see what lied ahead, so you know – the end justifies the means and such. Unfortunately, as mentioned earlier, I saw no end, save for that of poor lil’ catface, game over’ing upon having its three hearts removed. Is there even an end to Kitten Smack, or is it simply a case of seeing how far one can soundblast its protagonist? Somehow I find the latter hard to believe, as then surely… some form of measurement in distance would be included. In spite of that, it’s an undeniably fun little game that’s very easy to pick up and play, controlled entirely by the mouse and its two buttons. Kitten Smack is available on itch.io, for free.